This is third episode of my Data Coding in Bash series. We’ve already set up a fully functioning data server, have learned the basic orientation commands and have learned the basics of data cleaning and shaping in bash. In this article we will do the first steps with basic mathematical and statistical functions that will get us closer and closer to doing actual data science in the command line. Plus we will also start with bash scripting! Note 1: to get the most out of this article, you should not just read it, but actually do the coding part with me! So if you are on your phone, I suggest you save this article and continue on Desktop! Note 2: If you don’t have the data infrastructure yet, you can install it on your own in roughly 30-60 minutes: Data Coding 101 – Install Python, R, SQL and bash! Just for the record! I do like pre-built statistical, mathematical and predictive analytics packages and modules, regardless of whether we are talking about Bash, Python or R. However what I do not like is a data scientist who is not 100% aware what’s happening in the background when he/she uses this pre-built stuff. I’m a big fan of learning by doing, so in my opinion the best way to make sure you understand the math behind these packages is if you actually build them yourself – at least once in your life. Today we will do something like this. And we will start with the easiest ones: MAX, MIN and MEDIAN. Now back to the command line! I have two tiny demo-data-sets for you. You can download them to your server with wget. Make sure that you are logged in to your server – and create a new folder (I’ll call it sortdemo) next to practice (practice is the folder that we’ve used in the previous bash articles), then download the demo-data-sets with wget. There is a pretty easy-to-remember command line tool in bash to sort things with… It’s called the sort command. Sorted in alphabetical order. Beautiful! Good! sort is pretty straightforward! Here are some more options that you will find handy. Try them one by one! sort -r demo2.csv –» -r means reverse. Instead of an ascending list, you will have a descending list. sort -r -n demo1.csv –» It works with numbers as well if you add the -n option too (e.g. it could be useful for creating a top-down list). sort -t’,’ -k2 -n filename.csv -–» You can’t try this on demo1.csv, but feel free to go and try it on the flightdelays.csv file. -k means “key” and -k2 tells sort that the key of the sorting should be the second column and not the first (which is the default). But as per usual, bash doesn’t know what character is separating your columns, so you should specify it with -t’,’. It’s pretty much the same thing -d’,’ did for cut. Then you might ask, why is the syntax for the same option different: -t for sort and -d for cut? The creators of sort (Mike Haertel and Paul Eggert) are not the same people as the creators of cut (David M. Ihnat, David MacKenzie, and Jim Meyering), so they just simply didn’t follow the same naming convention. This is not the only time you will see inconsistency across command line tools, so it’s just better to get used to it! Calculate MAX, MIN and MEDIAN! Now that you have learned sort, go back to your flightdelays.csv data set. I have 3 exercises for you. All three are doable using some of the command line tools you’ve learned so far. What was the MAXIMUM delay in Arrivals? What was the MEDIAN of the all the delays in Arrivals? Spend some time trying to answer these questions. Once you are done, continue reading and you will find my solutions. With the cut command, we can keep only the 15th column, which is ArrDelay. Then we pipe this data into sort -n. Eventually we print only the last line, which is the actual maximum value that we were looking for. The only thing I’ve changed is that instead of tail -1 I put head -1 at the end, which gives back the first and not the last number of the sorted column. Back to middle school: What is the median? Simply put: median is the “middle” value of a data set. E.g. take the data set: [1, 2, 3, 5, 6, 13, 100]. Sort them, then take the middle one: 5. That’s the median. If your list has an even number of elements (e.g. [1, 2, 5, 7]), then the median will be the mean of the middle two numbers (in that case (2 + 5) / 2 = 3.5). cut -d',' -f15 flightdelays.csv –» Never miss this step! Keep watching your terminal screen and you will realize that you have some missing data (NA) and an unnecessary header (ArrDelay) in your data set. Both of these should be removed. The median is the middle value of this list. (Make sure you sort it first.) So you should divide 7275288 by 2. It’s 3637644. And as 7275288 happened to be an even number, you need to pick the 3637644th and 3637645th values. The Median is the mean of these two: 0. Note: Notice how iterative bash is! We get the results in 3 steps, with little modifications of the command at each step. 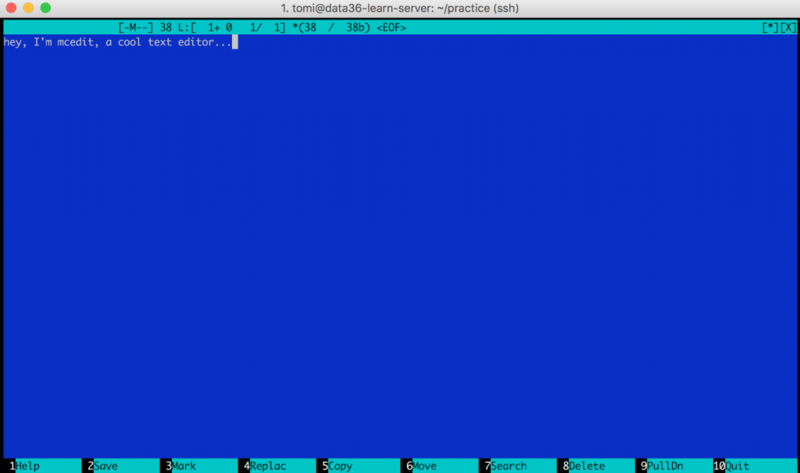 Looks really retro (hey, after all, it’s from 1994), but it will be super useful when you start bash scripting or when you want to quickly create a new text-file (or when you want to look hip in Starbucks). Boom! Ready for text-editing! (You should see the same blue picture that I have attached above.) What I particularly like in mcedit is that you can use your mouse here (finally, back to graphical user interfaces)! So when you want to exit, you can click the “Quit” button in the bottom right corner – or when you want to search something, you can click the “Search” button on the bottom menu. Anyway – type some text in, click the “Quit” button and save your file. You will have a new file in your folder that you can print like every other file – with the cat command. Print unique values and count them! Let’s create a new text file with some numbers in it! I called my new file demo3.csv (just to stay consistent with the naming of my demo files). As you can see, it only unifies adjacent lines. Sometimes it’s useful (e.g. when you want to remove duplicates), but in data science, we usually combine it with sort, so you can get a list of each unique value of your data set. So why am I showing this to you? Because uniq has some pretty cool options. Here’s the one that I use the most. It counts the number of occurrences of every unique value in your file. We had four occurrences of 1, six of 2 and three of 3 in our data3.csv file. How is this useful? Let’s do this exercise and you will find out! Back to your flightdelays.csv file! Question is: How many different airports do we have in our flightdelays.csv file? First you cut the Dest(ination) column (it’s the 18th). Then you sort and uniq the airport names. Then you count the number of lines with wc -l. The result is 311, but mind that there is a header line, which you should not count. This makes the real result 310. List out the top 3 destination airports (by the number of arriving planes)! You cut the 18th column (Dest) again. sort the results and use uniq -c to count the number of occurrence of each value. You turn this into a “top list” with sort -n and you keep the top 3 with tail -3. You have just found out with bash + command line which airports were most frequently flown to in 2007! Now imagine that these are not airports, but users, and we are talking not about airport-landing, but feature usage… This is something that actual online data analysts do from time to time when they are doing their jobs! In data science it’s a pretty common case that you are working with live or semi-live data. E.g. many startups run their analyses every midnight, so when the decision makers go to the office on the next morning, they can see the updated numbers and charts. Of course it doesn’t mean that an analyst sits there and pushes the buttons every midnight. More like, smart analysts and data scientists create scripts that automatically run every midnight. I remember when I wrote my first bash script (which was actually my first data script as well), I was very surprised at how easy it is. A data script is nothing else but the commands – that you would type to the command line – listed one after another in a text file. That’s it. For a start, let’s go with a very simple script – type this into your editor. echo "The top 3 airports:"
echo "The number of unique airports:"
cut flightdelays.csv -d',' -f18 |sort |uniq -c |sort -n |tail -3 –» You know this line. echo "The number of unique airports:" –» Same printing function. cut flightdelays.csv -d',' -f18 |sort |uniq |wc -l –» You know this line too. If you are done: click “10 Quit” and save your file. Your script’s extension is .sh, which stands for Shell Script. If you don’t add the .sh, that won’t cause any practical difference. The answer will be an error message (Permission denied). Your script executes the commands you typed line by line and gives back the results on your Terminal screen! I wrote this script when I wanted to find the best rental deal in Budapest back in 2014. It went through the website of the top Hungarian real estate portal every 5 minutes automatically and sent me an email when it found something new that fit me. I managed to find an apartment for 40% less than the market price! This second script is much more complex! Actually it calls other bash and SQL scripts as well. This was my first pet project back in 2012. It collects and analyzes the news from ABC, BBC and CNN. It pulls and connects the articles from the different news-portals if they are about the same topic. Finally it compares their credibility based on the wording of the articles. We went through many many important things in this article. uniq and sort are very useful commands to use for actual analysis of your data. Bash scripting supported with mcedit will be a great ally of yours as well during your data science career! Just a note, fix your h2 tags, they’re missing the ending ‘<'. Thanks for the content, looking forward to more data science topics. oh, wow, I don’t know how that happened! Great tutorial, thanks for taking your time to write this. The only thing I can say is that in “STEP 2) Filter the garbage…” wc is missing at the end of the command. In particular, the example of the median is a little tricky in this way, would be great if you explain this using awk or something similar. Woops, you are right on wc, I’ve just fixed it now! I think the next step of that example “STEP 3) Pick the numbers:” is missing a `sort -t’,’ -n` operation before the head and tail commands. Otherwise, the “-5, -3” are just the two values that happen to be at that position but don’t represent the median. Assuming I’ve got the same dataset and didn’t miss a processing step, I get “0, 0” for those to values, so a median of zero. Shoot, I was very imprecise with this Median example! Thank you for your contribution, Geoff! 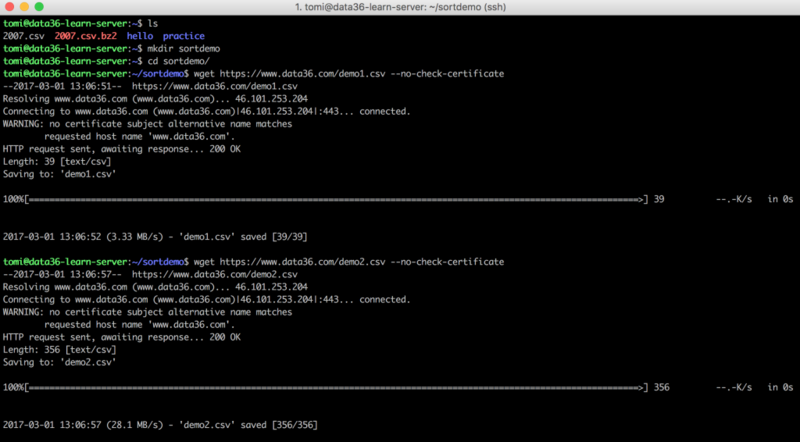 To connect to https://www.data36.com insecurely, use `–no-check-certificate’. How do I get around this? Thanks! Did this fix the issue? Oh yes, thank you for your quick response! That was the fix! Thanks for the great content. Highly appreciated. cut -d',' -f15 flightdelays.csv | sort -n | grep -v 'NA' | grep -v -n 'ArrDelay' | tail. Hey Greg… hmm, this is odd. the last line’s number is 7275289. Sorry, but I have no idea at the moment. Related: When I was trying to solve the question alone I searched for a way to remove the first line and got tail -n +2 filename.ext , works great, I think it’s a better option to remove headers. Thanks for the great content Tomi! It’s not a big difference from your code, just I rotated top 3 destination airports from lowest to highest :).